Secondary Glazing is the perfect solution to preserve the charm and integrity of your existing windows whilst gaining all of the benefits of modern Double Glazing without the expense. Our secondary glazing system is a slim line unit designed to be as unobtrusive as possible with each piece manufactured to your individual requirements including a huge range of colours to match your existing framework to ensure that the secondary frame will blend in. The system involves the installation of new, fully independent secondary window frames on the room side of the existing or primary window. Our secondary glazing systems are widely used within offices, homes, hotels, museums, education and healthcare premises laboratories and clean rooms as well as public buildings. They are also uniquely suitable for listed and heritage buildings where the existing windows are part of the overall charisma of a property. This is why secondary is perfect for those with planning restrictions such as listed or Heritage buildings. 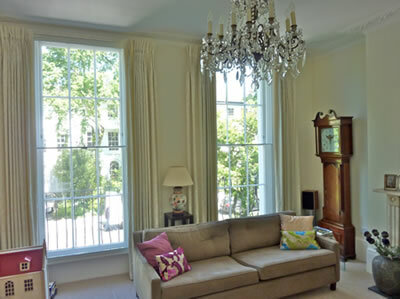 We have carried out many installations over our 30 years of trading to a wide cross section of applications including the most prestigious A listed Heritage building to very small properties on a restricted budget. Fixed Panel – Fixed panels are the smallest, simplest form of secondary glazing and good value. Face fixed with screws or with turnbuckles to be easily removed as required. The unit has a neoprene bubble gasket to the rear which provides superb air tight sealing qualities. 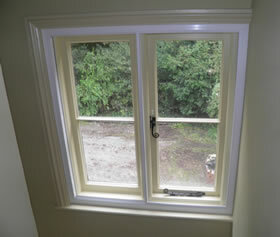 They are often used for non-opening windows, wooden doors suffering from draught and bespoke projects. Slimline Hinged Panel - A frameless hinged panel is ideal for single windows, small doors and where sliders may not be an option. Lift Out Unit - Essentially a removable panel in an outer frame. Great for fixed windows where only occasional access is required for cleaning etc. 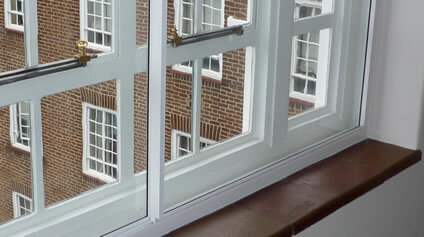 Horizontal Slider (Side to Side) - One of the most commonly used forms of secondary glazing. Ideal over typical 2 and 3 pane external casement windows, patio doors and any window formation with vertical sight lines. There is no limit on the number of panels in one individual frame and frame length is up to 5.5m. Frames can be joined catering for bigger windows/partitions etc. 3 Track option is available for maximum opening effect. Panels are removable at anytime. Counterbalanced Vertical Slider - The most popular option to insulate existing PVC, timber, Aluminium and traditional vertically sliding windows. Also used for single, top hung, stacked windows and hatchways. Sliders are operated via the full length handles located on the bottom of each panel. The panel can be slid to any position as required and are held in position by the spring balances in the side of the outer frame. Tilt-in Counter Balanced Vertical Slider - A heavy duty version of the Standard Counter Balanced Vertical Slider with the addition of Tilt-in for cleaning facility. Panels tilt in down to 40º, activated by two concealed tilt latches located at the top corners of each panel. An allen key styled key is provided to operate tilt latches. These are fully integrated and tamper proof from unwanted users such as children and hotel guests. Available with acoustic glass options for further noise reduction.